Beth Mead scored twice as Arsenal moved top of the Women's Super League with a resounding victory at Liverpool. Kim Little guided in Katie McCabe's low cross and Mead added a second for Arsenal when her strike squeezed past Anke Preuss and was eventually given. The visitors led 3-0 when Mead's mishit cross floated in at the far post, with Dominique Bloodworth heading a fourth. Courtney Sweetman-Kirk's penalty gave Liverpool a consolation before Vivianne Miedema netted late on for the Gunners. Joe Montemurro's Arsenal are a point clear with a game in hand on title rivals Manchester City, who they face on the final day of the season. Liverpool keeper Preuss will be disappointed with each of Arsenal's first two goals, Little's finish bobbling over her outstretched hand and England striker Mead beating her at her near post from an angle. Mead's first was not initially awarded by the assistant, but was given by the referee once it was established the ball had gone the right side of the post. Match ends, Liverpool Women 1, Arsenal Women 5. Second Half ends, Liverpool Women 1, Arsenal Women 5. Attempt missed. Dominique Bloodworth (Arsenal Women) header from the centre of the box misses to the right. Assisted by Daniëlle van de Donk with a cross following a corner. Corner, Arsenal Women. Conceded by Sophie Bradley. Dominique Bloodworth (Arsenal Women) wins a free kick in the defensive half. Foul by Missy Bo Kearns (Liverpool Women). Attempt saved. Missy Bo Kearns (Liverpool Women) right footed shot from outside the box is saved in the bottom right corner. Substitution, Liverpool Women. Missy Bo Kearns replaces Kirsty Linnett. Goal! Liverpool Women 1, Arsenal Women 5. Vivianne Miedema (Arsenal Women) right footed shot from the centre of the box to the centre of the goal. Assisted by Katie McCabe. Substitution, Liverpool Women. Annabel Blanchard replaces Yana Daniels. Substitution, Arsenal Women. Viktoria Schnaderbeck replaces Leah Williamson. Attempt blocked. Katie McCabe (Arsenal Women) left footed shot from outside the box is blocked. Assisted by Dominique Bloodworth. 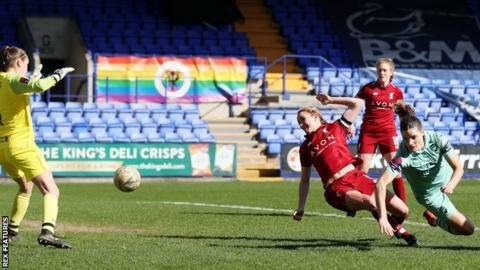 Kirsty Linnett (Liverpool Women) is shown the yellow card for a bad foul. Daniëlle van de Donk (Arsenal Women) wins a free kick in the attacking half. Goal! Liverpool Women 1, Arsenal Women 4. Courtney Sweetman-Kirk (Liverpool Women) converts the penalty with a right footed shot to the top left corner. Penalty conceded by Katrine Veje (Arsenal Women) after a foul in the penalty area. Penalty Liverpool Women. Yana Daniels draws a foul in the penalty area. Substitution, Arsenal Women. Jessica Samuelsson replaces Lisa Evans. Offside, Liverpool Women. Laura Coombs tries a through ball, but Courtney Sweetman-Kirk is caught offside. Goal! Liverpool Women 0, Arsenal Women 4. Dominique Bloodworth (Arsenal Women) header from very close range to the centre of the goal. Assisted by Katrine Veje with a cross. Goal! Liverpool Women 0, Arsenal Women 3. Beth Mead (Arsenal Women) right footed shot from a difficult angle and long range on the right to the top left corner. Assisted by Vivianne Miedema. Katie McCabe (Arsenal Women) wins a free kick in the attacking half. Foul by Yana Daniels (Liverpool Women). Delay in match Katrine Veje (Arsenal Women) because of an injury. Attempt missed. Beth Mead (Arsenal Women) right footed shot from the centre of the box misses to the left. Assisted by Daniëlle van de Donk. Katie McCabe (Arsenal Women) wins a free kick on the left wing. Foul by Leighanne Robe (Liverpool Women). Attempt blocked. Laura Coombs (Liverpool Women) right footed shot from outside the box is blocked. Assisted by Christie Murray. Foul by Louise Quinn (Arsenal Women). Christie Murray (Liverpool Women) wins a free kick in the defensive half. Attempt missed. Vivianne Miedema (Arsenal Women) right footed shot from the centre of the box is close, but misses to the right. Assisted by Katie McCabe. Katrine Veje (Arsenal Women) wins a free kick on the left wing. Attempt missed. Daniëlle van de Donk (Arsenal Women) header from very close range is just a bit too high. Assisted by Vivianne Miedema with a headed pass. Second Half begins Liverpool Women 0, Arsenal Women 2. First Half ends, Liverpool Women 0, Arsenal Women 2.